For the first time in over 40 years, boats will soon be able to travel from the Old River Lea to Waterworks River, thanks to restoration work taking place. The lock is unique, as it is the only lock in Britain with rising radial gates at both ends. Built in the 1930s, this design included two convex-shaped gates that lifted up vertically. The lock is crossed by the unusual three-span Diamond Bridge. The work is one of the final pieces of a ten-year programme to restore the Bow Back Rivers and preserve an important part of London’s industrial heritage. It will see new lock gates, restoration of the lock structure and the counter balance weights that enable the gates to open. It will also ensure that the lock plays an important role in flood prevention, with the new gates being automated to enable flood water to be distributed to channels within the Bow Back Rivers. The Canal and River Trust are leading the £1.75 million project, which includes £680,000 funding from the Heritage Lottery Fund and £100,000 from the London Legacy Development Corporation. The new lock gates, gantry and operating mechanism will be manufactured in Sheffield. Weathering Steel will be used for the gantry, creating an eye-catching rust effect, designed to contrast with the overhead stainless steel bridge. Dozens of our walkers have been admiring the work as they cross the site during our walking tours. We’re looking forward to the 28th August 2017 when the East London Waterway Festival will take place, celebrating everything the local rivers and canals offer, and the completion of this project. 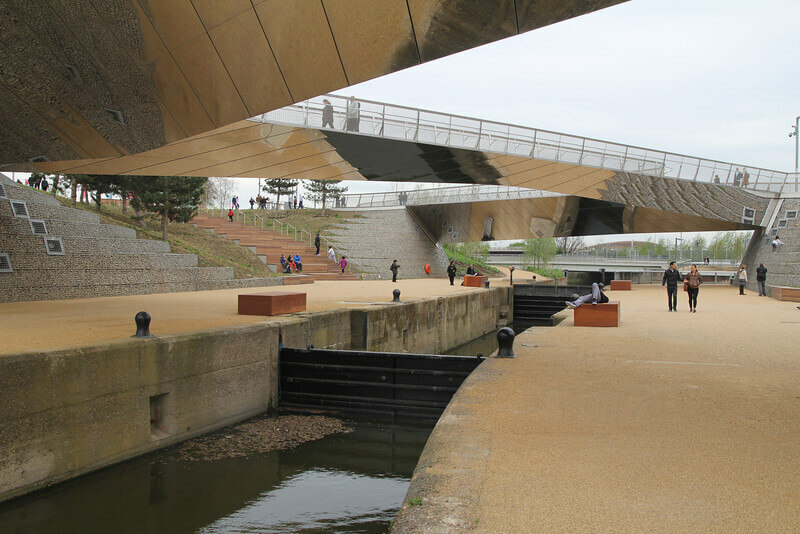 Over the years, our profesional guides have witnessed the restoration of the various waterways around Queen Elizabeth Olympic Park and seen them transformed from polluted no-go areas, to clean, useful assets that can be enjoyed both by visitors and the local community. Come and join us on a guided Park Walk and we’ll tell you all about the project.